Be on the look out in your mail box (snail mail) for a special message from KingsIsle. You maybe one of the lucky people to receive Marco Pollo’s Map. We got ours, don’t miss yours. If you’re a member of Wizard101 and you live in the U.S., you should receive a copy of this special map. Monquista, Mooshu, Polaris, Skull Island,Valencia and Wizard City! Track Marco Pollo and his crew across the Pirate Spiral in Pirate101! Decipher the secret code by reading Marco’s clues about the map and enter the complete key on Pirate101’s website! The clues give you plenty of information to figure out the clues if you’re a Wizard player. So don’t worry if you haven’t seen the Pirate Spiral yet. Next to the icon of each world, you’ll find a special 4 digit code. If you correctly answer each clue on the side of the map, then enter the special code in the correct order at Pirate101, you can acquire a special Companion! You can use the complete key once per account and up to 4 times! If you have 4 accounts, you have 4 keys to use. If you don’t use all 4, go to the Pirate101 forum and see if there’s someone overseas that didn’t get a code who you might like to give your extra code(s) to. 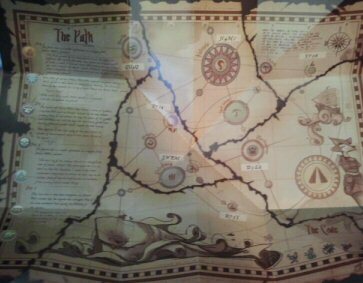 If you need help solving the clues, look on the back of your map and read the instructions. You’ll find more information for how you can get help. The map will give you 7 world codes, but you only need 5 to pick up your new Companion. You should have two of the 4 digit numbers left over. Use those two numbers at “pirate101.com/_ _ _ _ _ _ _ _” and you can see a special letter between Marco Pollo and Headmaster Ambrose! It will tie up many loose ends about the Spiral. The mailing was only released to players of Wizard101 from the United States. If you’re outside the U.S. don’t be totally discouraged. One Eyed-Jack is alerting the KI Marketing department of the large interest overseas in hopes of a wider inclusion for the next offering.